Lapinette turned and walked through the graveyard. 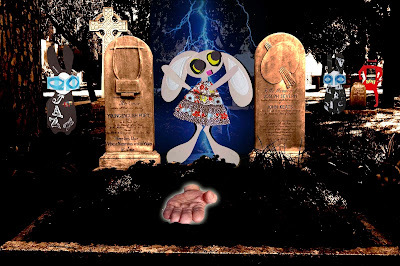 The Wabbit signalled for the rest to keep a respectful distance as Lapinette paused between two gravestones. The hand settled quietly on the grassy plot in front. Lapinette raised two paws skywards and waited. Branches lowered. Thunder rolled. Lightning flashed. Cloaked in a clear blue light, Lapinette began to speak. "The part is the whole, the whole is the part." Somewhere in the distance, a piano played Mozart's Requiem. The Wabbit delved deeply for his medal ribbons and attached them to his fur. Wabsworth bowed his head and so did Skratch the Cat. Now the distant piano played joyfully. "Freude, schöner Götterfunken," said Lapinette. Everyone smiled as the hand sank into the grass. Wabsworth felt something rippling through his android circuits and Skratch's tail stood bolt upright. The hand sank deeper - but just before it disappeared, it made a small wave of farewell. The Wabbit saluted. "I leave you in good hands," said Lapinette and she slowly dropped her paws. Rolling thunder became silent. Lightning ceased. The piano began to play jazz and it filled the wooded space. 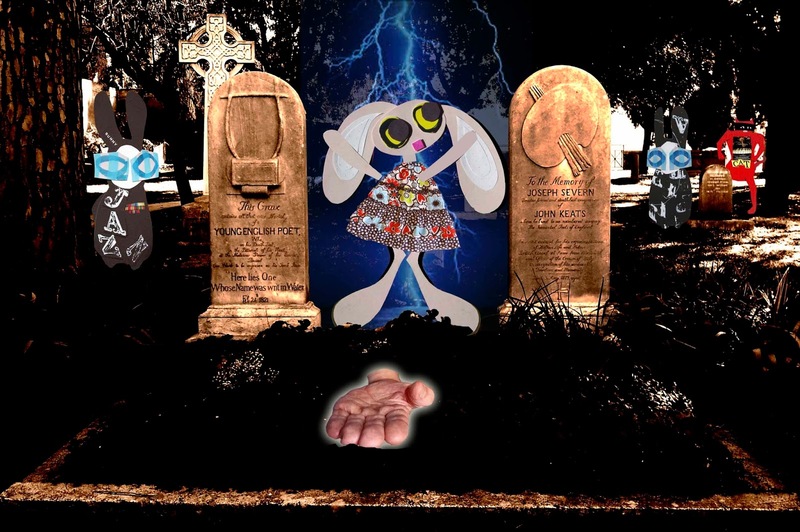 The Wabbit watched the last of the hand fade from sight. "Take Five," murmured the Wabbit and he waved goodbye.